WHEN: In 2001, Julianne Boyd, the Artistic Director of Barrington Stage Company, formed the Playwright Mentoring Project in Great Barrington. Originally, PMP began with one group of ten teenagers, and now, twelve years later, it has bloomed into a wider, more expansive effort reaching seven groups of teens split between North Adams and Pittsfield. Currently, the program serves 70 students. WHO: After conducting production work for the first year in Barrington, Frank La Frazia took over as PMP’s director when the program moved to Pittsfield in 2002. Together with a group of dedicated mentors, Frank has helped the program’s young participants work through some of their past hardship and create an artistic work indicative of reflection and healing. 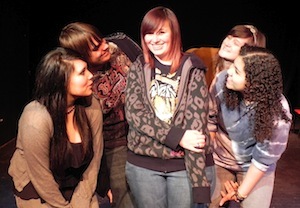 Each group has an artistic mentor who leads the project, two peer mentors who are slightly older and have faced issues similar to participants, a professional playwright who helps with the artistic process and a therapist who provides counseling as participants address emotional issues during the process. WHY: After speaking with Frank, it’s clear that the project is driven by its rehabilitative service to teens: “If we can get them to think: How can I make a better choice next time around… then we’ve done our job.” Both Frank and Hester Kamin, the Stage Company’s Director of Education, shared thoughtful stories about their experience. Hester recalled working with a young woman who struggled with self-harming habits. When she performed her artistic piece about dealing with these issues, her work resonated with the audience and inspired about 50 people to talk with her after it was over. Frank remembered an early participant in the program who hadn’t taken it seriously in the beginning. Later on, this young man proved his commitment to the project and continued working with PMP after he finished the program. Without PMP, this troubled teen might not have had the resources or support to become the empowered individual he is today. Over the course of 12 years PMP has served approximately 400 students and reached more than 3500 audience members. It’s impressive to imagine how many more positive narratives there must be like these two. IMPACT: Through theater, the Playwright Mentoring Program helps to provide underprivileged youth with the means to acquire a more hopeful outlook. Frank and his team have taken in teens from troubled backgrounds that may have made mistakes in the past and given them a second chance to lead a more positive, healthy life. With the PMP they can do it with the support they need. From the Program, the kids receive a sense of community and an open, inclusive environment where their stories can be heard. For participants, it’s not about reliving the past, but instead about learning how to move forward. Pittsfield can be a hard place for kids to grow up – its poverty level is 11.4% compared to the state average of 7.7%. Additionally, the staggeringly high teen birth rate of 55.1% presents a major obstacle for youth in the area. Here, PMP reaches out to the kids at a point in their lives when they need it most. By providing these alternative probation programs, the Barrington Stage Company implements a useful service for the state at much greater benefit to its participants. Given its positive environment, characterized by growth and encouragement, the teens that have completed the program show discontinued drug and alcohol usage, better anger management, and greater success in school. The Playwright Mentoring Project has made an outstanding contribution to the Pittsfield creative community by way of theatrical productions about relevant issues. Just as important, it has helped its participating teens develop into empowered leaders capable of astounding creative feats. To learn more about the Playwright Mentoring Project and their upcoming events, visit their page on the Barrington Stage Company’s website. i loved being in PMP :) it was life changing and i learned to trust people and to get to know people better and not automatically just assume that someone is good or bad i could express anything with my group and they wouldn’t do or try to do anything but help me :) i’m thankful and very grateful to have joined PMP.